Bleriot XI – The Pioneer Aviator – Engines Parts ETC. It is possible to say that the most successful aeroplane of the early aviation era was the Bleriot XI. This monoplane is the first aeroplane where we can find the common surfaces and control systems of nowadays aeroplanes. It was developed from the Bleriot VIII monoplane which was built in 1908, and successfully flown by Blériot several times. The first Bleriot XI appeared at the Paris Aero Show at the end of 1908, but at this time the plane was fitted with a 35 horsepower, REP 7 cylinder engine. The plane did the first test flights with this type of engine but it seemed to be unreliable. To solve the engine problem of the machine, Blériot contacted Alessandro Anzani the famous motorcyclist and engine designer. Anzani designed the famous 25 horsepower W configuration 3 cylinder engine, for the XI monoplane and this is where the story really started. The fame of the Blériot XI comes from the Channel Crossing flight. On 25th Of July 1909 Louis Blériot took off with his Bleriot XI from Calais with the aim to fly through the LaManche channel and land in England. After 36,5 minutes he landed near Dover/England, so the flight was successful. With this historic flight Louis Bleriot became world famous and also he won the Daily Mail’s 1000 pounds price. The Channel Crossing flight helped Blériot to start his own aeroplane factory, so he started to build the XI monoplane in series for other aviators. Later the Anzani engine was replaced with several types of more powerful engines like the Gnome Omega. All in all, the factory built more than 1000 aeroplanes from the variations of the XI monoplane. 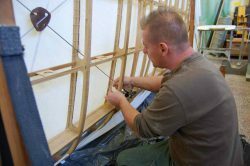 To build and fly a pioneer era aircraft is challenging but if you know how to handle it has a very special feeling which is quite a fun. You feel that you are conquering the skies. As the Bleriot XI was a very successful aircraft and the dream plane of László Ungár the company started to work with the XI monoplane. The project started with finding the building plans of the aeroplane and of course the Anzani 3 cylinder engine. We started to make the first replica in 2012. 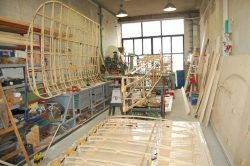 The project started with the fuselage as this is the most complicated part of the Bleriot XI. It is built up from ash wood pieces and metal fittings. The fuselage is not glued like a normal aeroplane. It is only fixed together with wires and turnbuckles. When the fuselage was 80% ready we built the wings and other surfaces. The Bleriot has a very special airfoil called Eiffel 13. The challenging part of the wing was the size of it. A Bleriot wing is 2,04m meters deep and 4 meters long. So the total span with the fuselage is 8,60 meters. The wing is built up from plywood and ash ribs and ash main spars. The First Bleriot XI of our company was completed in 2014. Soon after the completion, the plane debuted at a Hungarian display hall called Vigado. This is the same place where Louis Bleriot exhibited his aeroplane in 1909 when he visited Hungary with his original monoplane. 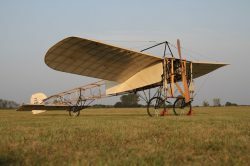 If you also dream about a Bleriot XI feel free to contact us and we can make it for you!